Soho Teen, in partnership with Readergirlz, is sponsoring this year’s Operation Teen Book Drop, a national reading initiative celebrating YA literature! * Print a copy of the bookplate and insert it into a book (or 10!) On April 18th, drop a book in a public spot (park bench, bus seat, restaurant counter?) Lucky finders will see that the book is part of ROCK THE DROP! * Snap a photo of your drop and post it at the readergirlz Facebook page. Then tweet the drop at #rockthedrop with all the other lovers of YA books. Additionally, to further support YA titles, 826NYC is holding a book donation drive. The goal of the drive is to increase awareness for YA literature and to help 826NYC grow its library. 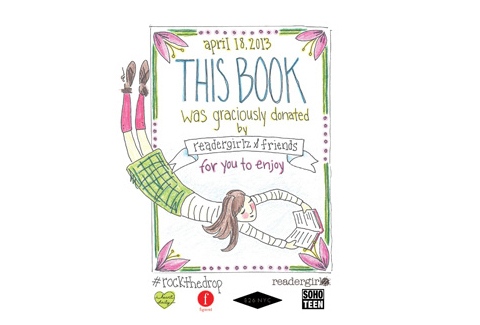 Soho Teen and all the other participants in this year’s program encourage lovers of teen fiction everywhere to make a book donation on Thursday, April 18th. So let’s get ready, YA readers, and make this year’s Rock the Drop the best one yet!